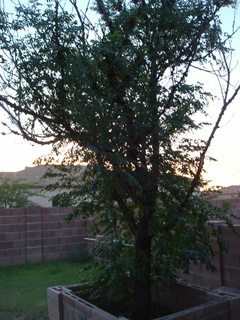 I've tried all the tree identifiers I could find and can't figure out what this tree is. medium tree, perhaps 15 ft tall? Please excuse the poor quality pictures. The tree is in Arizona. I have seen one or two other trees in my city like it, but I feel quite confident it is not native to Arizona. 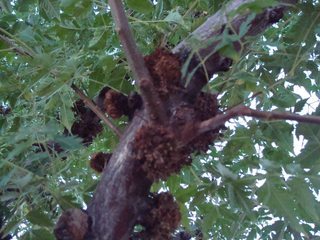 Also, the tree is recovering from Mistletoe, a parasitic plant that tries to grow from the tree, I believe that's what the strange nodules are. The nodules look like nuts, but are growing directly from the bark (there is no stem). Any help is appreciated, even if a best guess at its continent or country! UPDATE! The tree is well enough to bloom! My camera phone is really bad, but here are some more pictures. 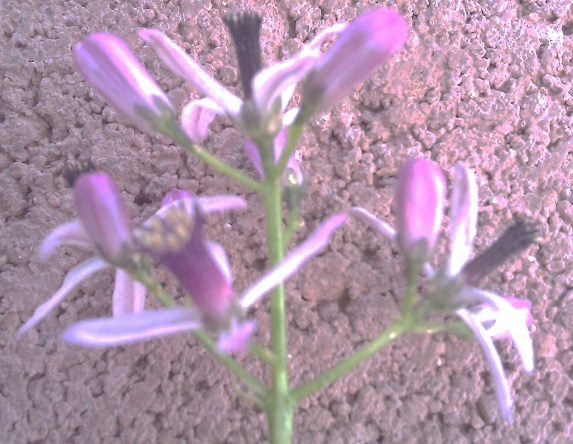 The flowers have five white petals in a star pattern, and a purple trumpet-neck that doesn't open containing yellow stamen. Difficult to say with these pictures. Bi pinnate leaves exclude Fraxinus or Golden rain (Laburnum anagyroides) and Pterocarya fraxinifolia, which has a comparable bark and the habit. 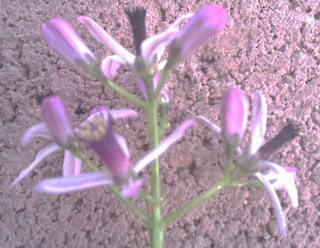 It looks like the leaves are alternating and not opposite (within the leaf the pinnate are opposite), which make Melia azedarach possible. Looking at the bark and the twigs I feel like it could be this, but the leaflets are of. Which brings us at the Koelreuteria. I don't know to much about this species, but google tells me that the mistletoe avoids Koelreuteria. I was thinking golden rain tree at first, but GRT doesn't have bipinnate leaves. Then, oh wait. 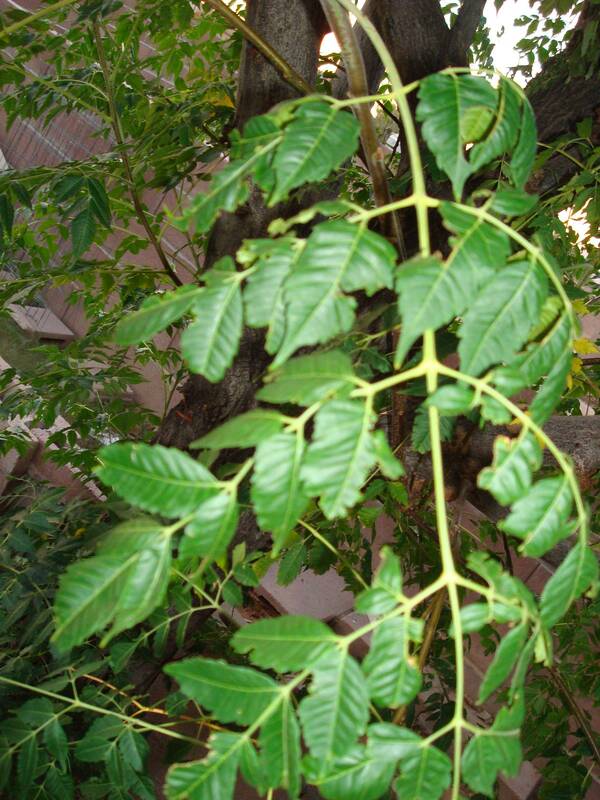 There are other species of golden rain tree, including...Koelreuteria bipinnata. I'm not certain it is that particular species, but it looks sort of like a Koelreuteria of some kind or another. edit: or maybe a chinaberry (Melia azedarach)? 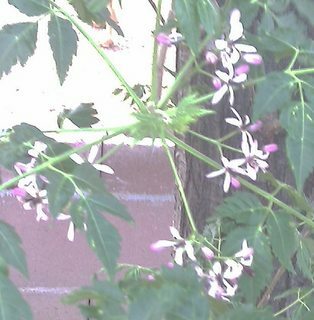 Both golden rain tree and chinaberry have alternate leaves, though. What is this small tree with partially serrated leaves and blue fruit? What is this small potted plant with a thick trunk and palmate clusters of 5 leaves? What is this thorny tree with small, oval leaves, and seed pods? What is this April flowering shrub with clusters of small flowers? 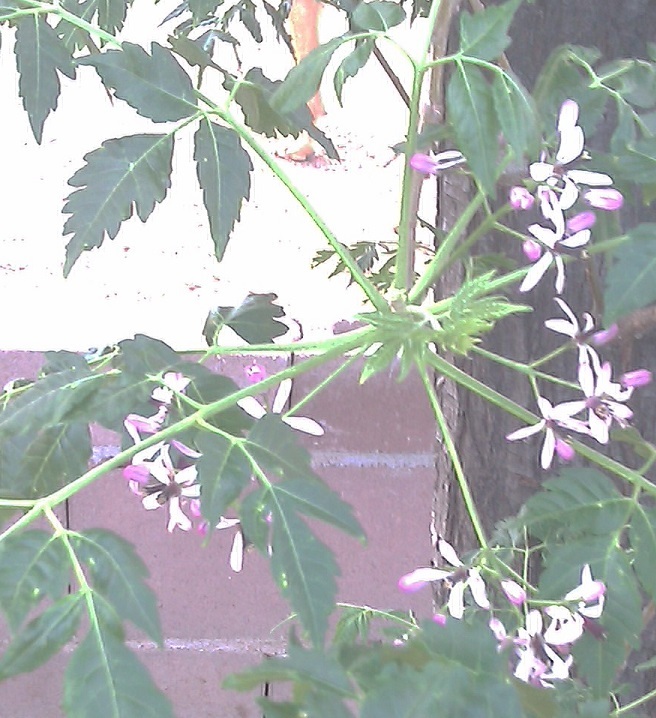 What is this plant with clusters of pink flowers with red centers, and waxy leaves?